LTi was the first organisation in Australia to have its Certificate IV in TESOL accredited. LTi has been responsible for delivering training across Australia (from Cairns to Perth), China, Malaysia, Korea, Iran, Singapore, plus distance students in various countries around the world. LTi publishes a full suite of TESOL Training resources which are used by over 20 different national and international training organisations. LTi is a Registered Training Organisation - endorsed by the Australian Government. LTi's accredited 10695NAT - Certificate IV in TESOL (Teaching English to Speakers of Other Languages) and 10688NAT - Diploma of TESOL (Teaching English to Speakers of Other Languages) courses have been developed in consultation with the TESOL industry to ensure that it not only meets industry expectations, but also exceeds them. Since the initial accreditation, LTi has improved, refined and rewritten its Certificate IV in TESOL several times to be the brilliant, ​highly respected course that it is today and we are not stopping there. We are constantly reviewing our courses and materials to ensure that they always meet the needs of the rapidly evolving TESOL industry. "The best resources and fantastic high-quality products I have received. Get hands on practical experience with placement in an English as a Second Language (ESL) class. Observe and work with an experienced ESL teacher. Plan and teach at least 6 hours of classes. Get fully equipped to ​go into the workforce straight after completion. Get experience that you can put on your resume. By the end of your course, we aim to make sure you feel confident in your ability to go into ESL classrooms all around the world and teach English. 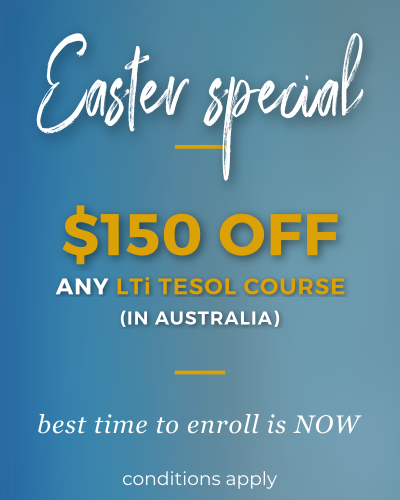 LTi's 10695NAT - Certificate IV in TESOL (Teaching English to Speakers of Other Languages) and 10688NAT - Diploma of TESOL (Teaching English to Speakers of Other Languages) ​are accredited qualifications endorsed by the Australian government. ​A mix of theory and practical - all Cert IV graduates complete a minimum of 12 hours authentic practical placement with real ESL learners - Diploma graduates complete a minimum of 20 hours of practical placement! Students can complete the course via Distance Education or at one of our class locations around Australia or overseas.